We are a full two weeks into our one-month spending freeze and so far, so good. I thought for sure we would run out of food in a week but at this point both our freezer and pantry are still brimming, which makes me think a.) we may have had too much stuff and b.) we could probably extend our spending freeze for another month without even coming close to running out of food. In all honesty, the hardest part about figuring out what to cook is the mental block of thinking there is nothing to make, when in fact there are all sorts of ingredients to choose from. 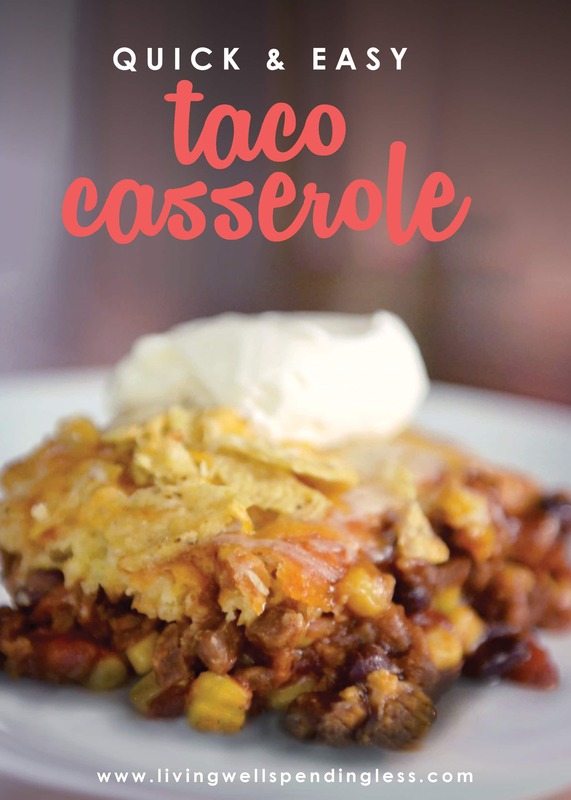 The other night Husband suggested we have tacos, which sounded great until I realized we only had 3 stale taco shells, so I decided to improvise and came up with this vegetarian Taco Casserole instead. It was a HIT! The girls chowed it and husband thought it was one of our best vegetarian meals ever, which is saying something since he is far more of a meat-and-potatoes than tofu kinda guy. It was also super easy & pretty much foolproof–a great one to have the kids help with. Step 1: Melt butter in large saucepan over medium high heat; brown vegetarian crumbles 5-7 minutes. Add water and taco seasoning, then add tomatoes, black beans, & corn. Stir until well blended then remove from heat. Step 2: Mix Bisquick, sour cream, eggs, & 2 cups shredded cheese in bowl until well blended. 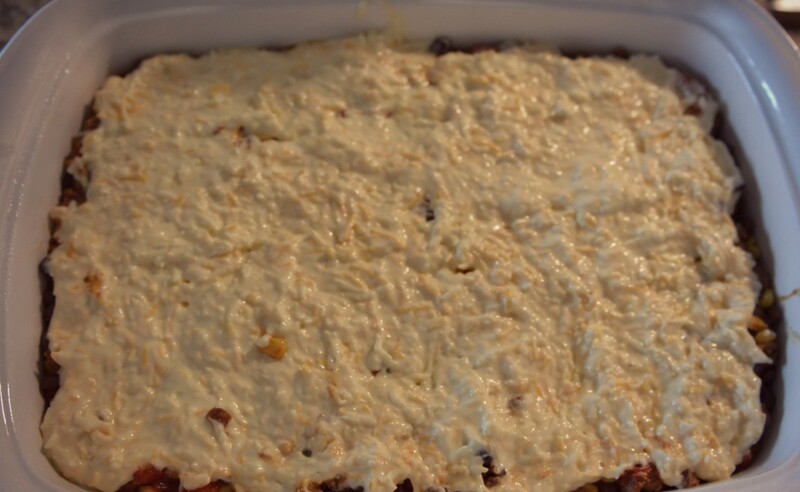 Step 3: Grease 9×13″ pan; pour in bean mixture. Spread out Bisquick mixture evenly over beans. Bake in 375 degree oven for approximately 30 minutes, until top is golden. Step 4: Remove from oven; sprinkle crumbled tortilla chips and remaining shredded cheese; bake 5 more minutes until cheese is melted. Top with sour cream and salsa, if desired. 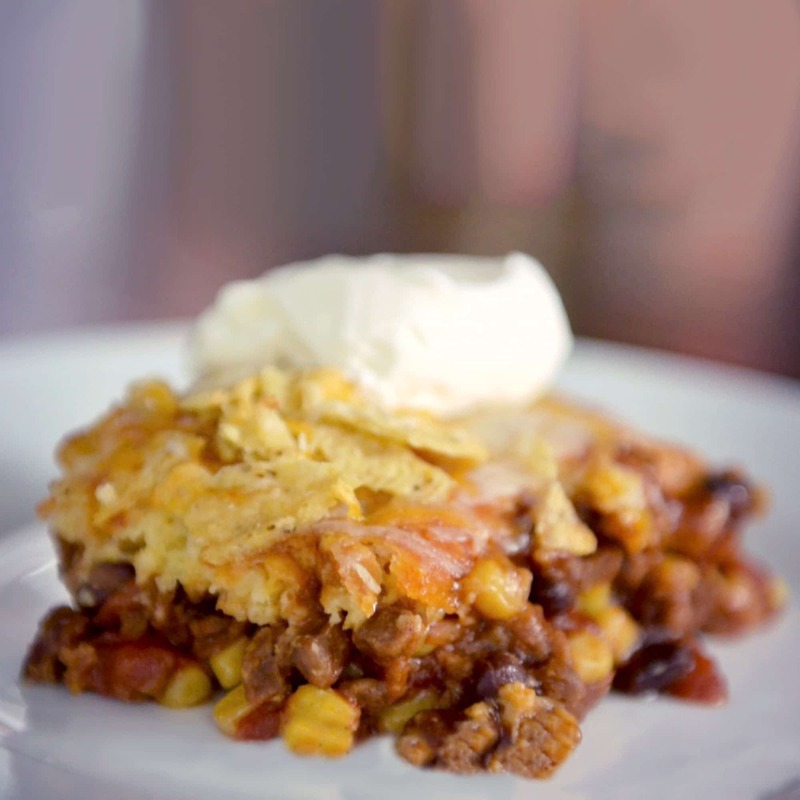 A quick & easy recipe using ingredients you probably already have on hand that the whole family will love! sour cream & salsa to garnish optional: lettuce, tomatoes, olives, etc. Melt butter in large saucepan over medium high heat; brown vegetarian crumbles 5-7 minutes. 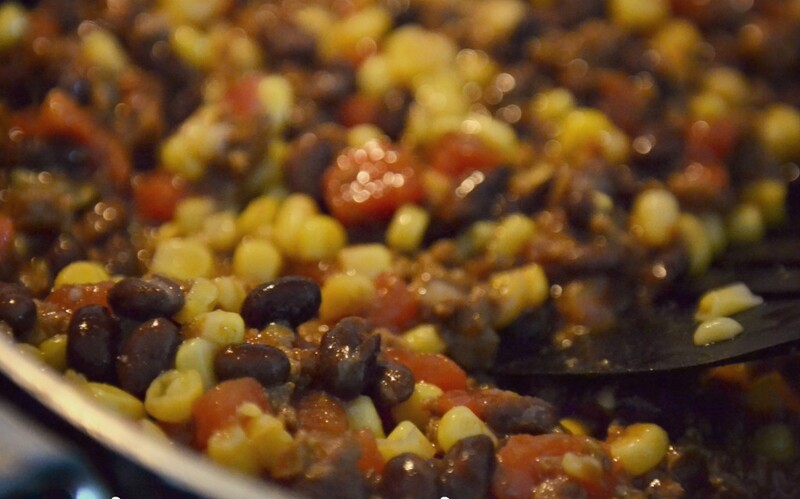 Add water and taco seasoning, then add tomatoes, black beans, & corn. Stir until well blended then remove from heat. 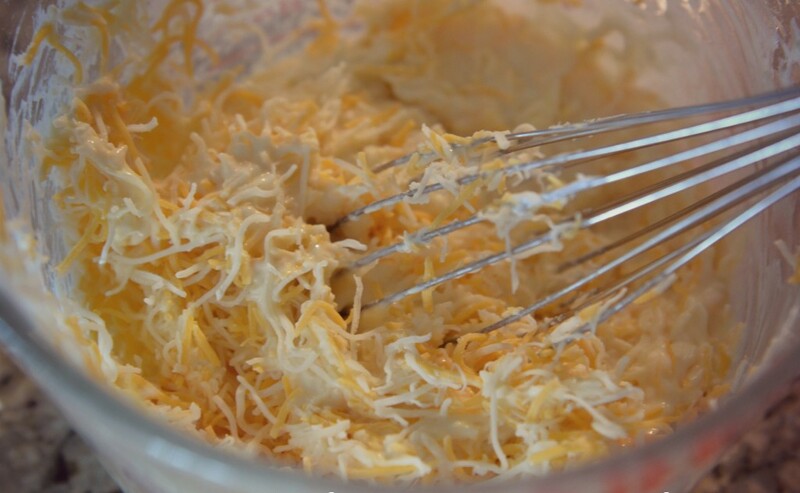 Mix Bisquick, sour cream, eggs, & 2 cups shredded cheese in bowl until well blended. Grease 9x13" pan; pour in bean mixture. Spread out Bisquick mixture evenly over beans. Bake in 375 degree oven for approximately 30 minutes, until top is golden. 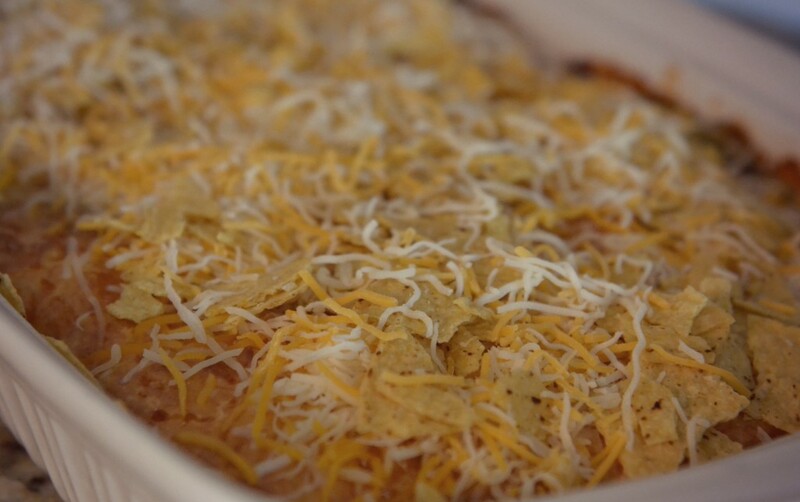 Remove from oven; sprinkle crumbled tortilla chips and remaining shredded cheese; bake 5 more minutes until cheese is melted. Top with sour cream and salsa, if desired. I’m with Debbie, I like the step by step and the printable version. Thanks for all you do Ruth! I appreciate your hard work! Sounds yummy. I might even try the vegetarian version as I’m typically a meat lover. Where do you find veg. crumbles? Also, (and you probably already know this), stale chips can be freshened up with a small amount of time in the microwave and then allow to cool. Thanks for your great work. Hey Debbie, you can find vegetarian crumbles in the freezer section by the veggie burgers. I have used 3 different brands–Boca, MorningStar, & Quorn. I can’t really tell the difference between the 3 so I usually just buy whichever ones are on sale. Thanks for the tip about the chips–I’ve never tried it in the microwave; we always use the oven! Thank you thank you thank you thank you THANK YOU for making it printable! I would LOVE to see all your recipes be printable like that! You should make your own cookbook! I love having both. 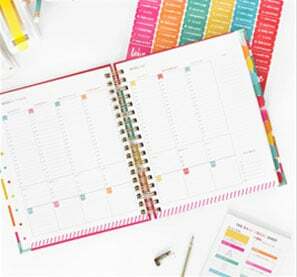 Your pictures are always great and explanations are helpful to read right now, but the printable is a necessity to add to the weekly rotation. I will definitely try this, however it will be with ground beef, unless I want my husband to run out of the house screaming! LOL Jenny, he might not even be able to tell the difference! This sounds yummy! I am making for dinner tonight. I have all ingredients at home, so that’s a big plus. I like the new easily printable too! Thanks Carla, I’d love to hear how it turned out for you! I like both pictures and printables. Happy to see recipes again 🙂 I’m a fellow vegitarian, so new recipe ideas are always a plus! This recipe came just in time. Last night I asked my daughter what I should make for dinner tonight and she suggested taco casserole. I don’t have bisquick, but I think I’ll make some type of cornbread mixture to go on top. That should curb my craving for cornbread, all in one big swoop. Thanks for the feedback Margaret! Let me know how it goes with the cornbread mix! Both please. The photos allow me to make sure I am doing it “right” the first time, and the printables allow me to make it again and again! love the phote version and am very greatful for the printer version..its my only hope to make it . thanks alot. Someone has to let Bioware know they closed, it’s not like how the ‘professional’ game journalists can easily. 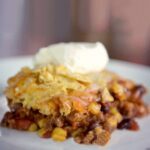 Hi, found this recipe under your grocery bill cutting post (loving it btw) and this sounds amazing… My question, if you do not want to use veggie crumbles (what is that btw?) can you add more beans? Thanks so much! Heather you could definitely add more beans. Veggie crumbles are made by Boca, Morningstar or Quorn brands and are basically a vegetarian version of ground beef. (Similar to how a Boca burger is a vegetarian version of a hamburger). You could also just use real ground beef if you eat meat. Hope that helps! Am I making the bisquick mixture? Or put in dry with s cream and cheese? This looks amazing! I’m a vegetarian too and I’d like to try this sometime. I made this for dinner last night. We are not vegetarians, so I used ground beef. I also left out the corn because I didn’t have it on hand. It was not as pretty as yours, but it didn’t matter because the taste made up for it! I will make again and add the corn next time. Thanks! This sounds so yummy, I can’t wait to try it. I am thinking of making this into a freezer meal to add to my stock, do you think it would freeze up okay? 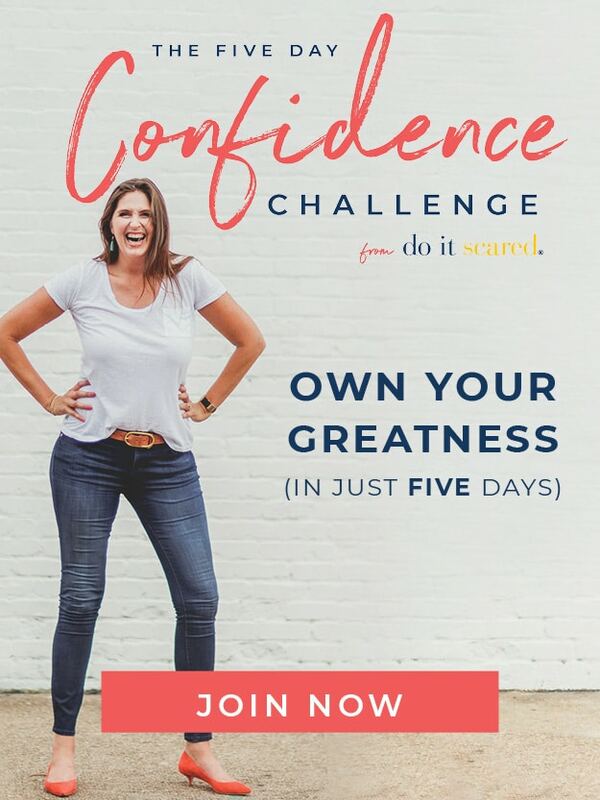 I agree with the other posters, I think printable and step by step instructions are great! I love being able to see all the great picture,s but also like being able to see the recipe in its entirety all at once. Thanks again, can’t wait to try this. the bean mixture turned out REALLY watery for me and i had a hard time spreading the bisquick mixture over it – next time i’ll maybe drain my corn and beans more thoroughly. i also made my own taco seasoning (there are recipes all over for it) and used the equivalent of 2 packs. I have this in the oven as I type. Can’t wait to try it. Picture shows corn but it’s not on list of ingredients or in directions. I forgot to put a can in…maybe next time. Has anyone used the corn? Which do you prefer? i prefer the printer friendly version….. Thanks for the wonderful recipes.. Finally, meals I can get my family to eat with me. I’ve had something similar, except with pasta throughout, not biscuit on top. Since its just me and my fiance I want to make this and bake half and save half. Any special freezer instructions? Thanks for the marvelous recipes.. Finally, MEals I will get my family to eat with me. I was wondering if you’ve ever made this and frozen it for a later time. If so, how does the bisquick hold up? Should I just make that fresh and add it right before I bake it? This would be a perfect meal to take to someone in need of a meal. This has been in our regular meal rotation for over a year now! Everyone in my family actually eats it (which almost never happens) and it’s easy. I make variations here and there, like adding peppers or rice. Always a win in my house, thanks!